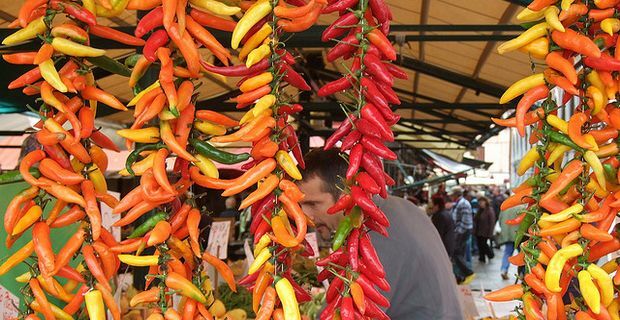 To obtain those authentic flavours in your Mexican cooking, you need to know about the different strengths and characteristics of chilli peppers. Chillis are about far more than imparting heat. Different peppers can offer infinite variations in flavour, smokiness, fruitiness and power. Scotch bonnet chillis are the weapon of choice for cooks who like that stinging heat in their recipes. For more authentic Mexican flavours though, use the small green serrano chilli or the fiery round habanero chilli, which is the same shape as Scotch bonnets. Chillis de Arbol are small and fierce, red, dried chillis, often ground into chilli powder and used as a spicy garnish or in salsas. Jalapeňo chillis are among the most common ingredients of Mexican dishes. They can range from sweet to searingly hot but the ripe red versions tend to be milder. These are the chillis to slice and serve with your nachos. The poblano chilli is a green, medium-sized fresh pepper that is often stuffed with rice or cheese and roasted as an appetiser or side-dish. Dried, it is known as an ancho chilli and takes on a warm, earthy flavour similar to paprika, making it an excellent addition to slow-cooked sauces or moles. Chipotle chillis are the dried and smoked version of jalapeňos, but with a more complex flavour. They are used to spice moles, dips and salsas, and will lift your Mexican dishes to another level. Use carefully as the heat level can be difficult to predict.